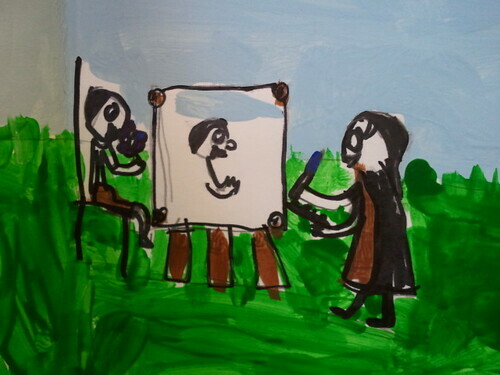 Today, the kids attended their homeschool Book Club. 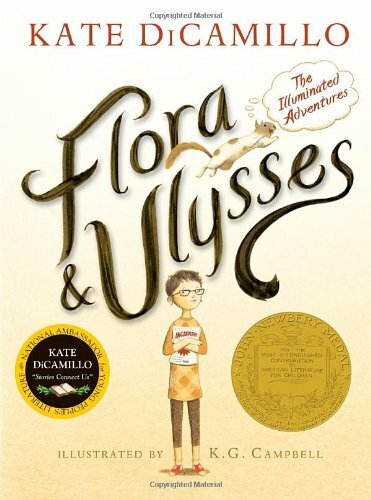 This year’s theme is “Friendship”, and the book for this month was Flora and Ulysses. The kids spent a few minutes doing an ice breaker, then went around the room and discussed their favorite parts of the story, which centers around a girl (Flora) and her squirrel-friend (Ulysses). Ulysses, who happens to have some cool super-powers, likes jelly sandwiches and donuts, so that segued nicely into snack time and then a little bit of free play. 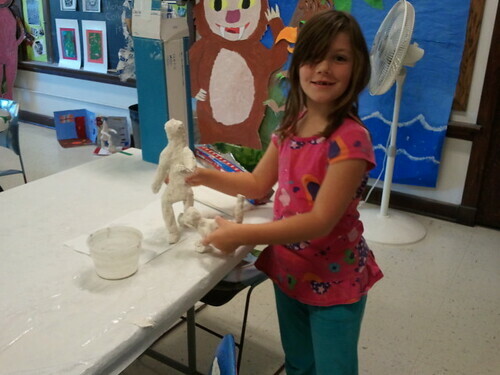 Today was the 3rd of 4 classes in this series at the Butler, titled “Plaster Action Figures”. 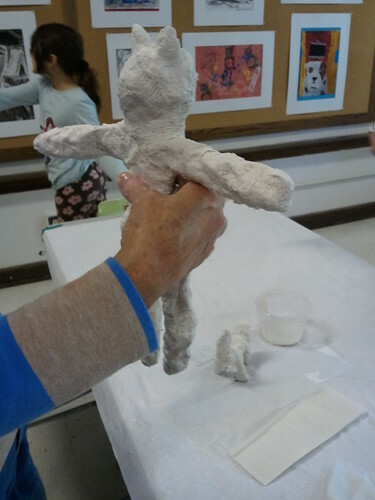 In today’s class, the kids finished their 3-d backgrounds and applied plaster (via plaster-impregnated gauze) to their action figures. 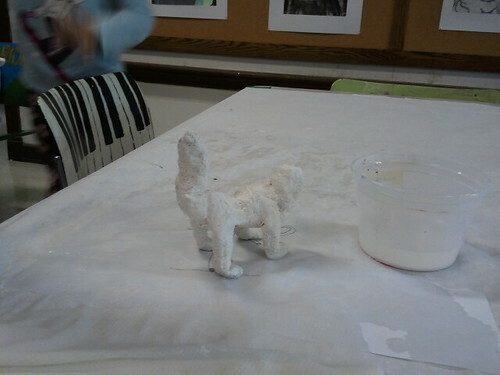 We got a peek at their works-in-progress at the end. O7 started to do a dog-walker, but changed to a cat and person (cat walker?) instead. 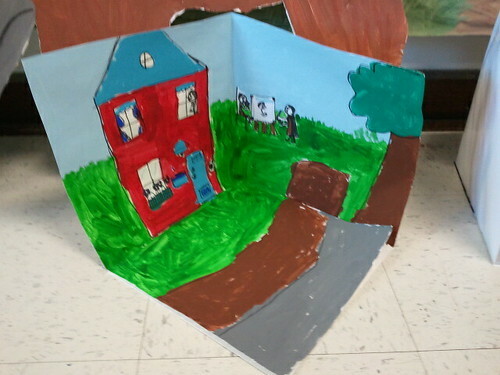 Her scene is a trail that runs past a house. 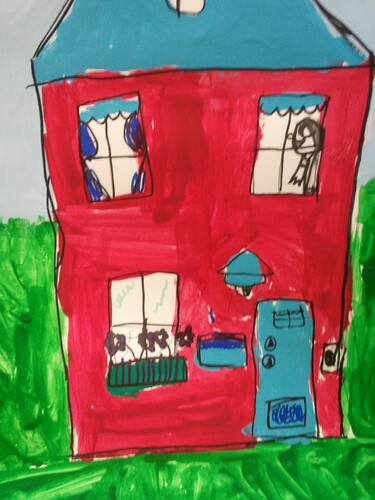 She made sure to point out the detail of the people inside the house’s upper windows. After class, we went to the park for a quick run around until lunchtime. Then we headed over to Chipotle with A and her mom, L, and met my friend G. We dined al fresco in the beautiful sunshine. G gave the girls each a bag full of Nancy Drew and Boxcar Children books. They each started one while we adults sat and talked. Later, we went to gymnastics. O7 worked on back handsprings in her novice class. She can do one with a spotter. S9 worked on some forward moves during her floor time, and also tumble track and beam. Today we are back to our regular schedule, after two weeks out on the west coast. We are still a bit jet-lagged, but got up today for an early music day. O7 went first with violin. She was reluctant (and tired), but got through her whole lesson with no complaint. She practiced Minuet I, then Tina had her play a G scale to get ready for Etude. They played through Etude together and worked on the second half (measure 9-end) where O7 had a few rough spots. 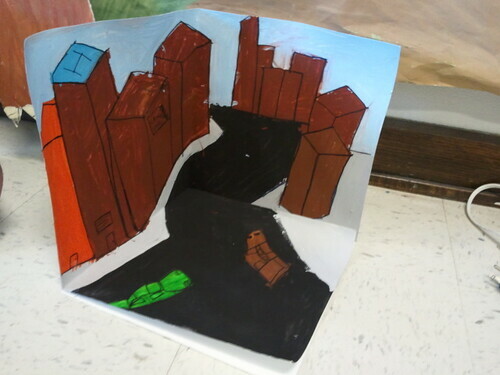 Next, we headed to Nelya’s for piano.S9 did her lesson and worked on a performance piece, the Spider, which she will probably play in a recital next month. This will be her first recital on piano, and she seems stoked about it. She did not do any theory today because Nelya wants her to concentrate more on her performance and technical pieces. I opted not to take a lesson today since we were not able to practice while we were gone. In the afternoon, we did some reading. My mom recently got the girls a few graphic novels that had been on our book list: Graphic Classics: Edgar Allan Poe ; HG Wells’ The Time Machine, and Graphic Classics: H.P. Lovecraft. We are enjoying these and the graphic format, which the girls have seen a few other times. They are also working through the Warriors series and we are on the last disc of The Slippery Slope. I can’t recommend the Series of Unfortunate Events books enough, especially in audio format (make sure to get the ones read by Tim Curry if you explore these!) The story is compelling, and the writing does not assume your children are stupid, as so many children’s books are wont to do; but the thing I like most of all are the delicious and subtle word plays throughout the books. There are so many turns of phrase and cool vocabulary words presented in the pages. The kids don’t realize just how many interesting expressions they are learning by listening to these books, a phrase which here means Mom has no problem at all driving an extra lap around the block to get to the end of the chapter. Today we hiked up through the woods to the library. The girls carried their own books. 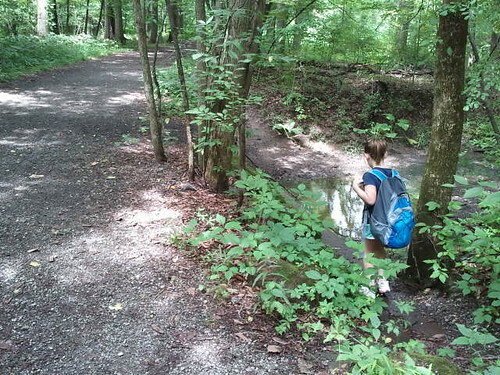 O7 carried her books in her backpack, but did not use the trail. 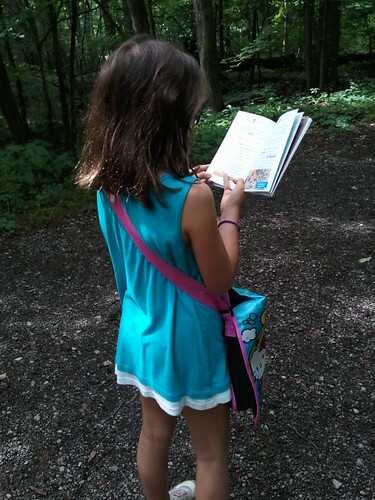 S9 used the trail, but did not carry her books in her backpack. We go to the public library often, and the kids read a ton of books- so many, that I could never keep up with them all. I try to list a representative sample on our Goodreads account. Naturally, they have each developed an interest in certain titles and series. Our local branch has an extensive collection of their favorites, but these voracious readers have devoured them all and still want more. So, today we learned how to request copies from other Ohio libraries. Each girl requested a book from Search Ohio. O7 requested one of the Flower Fairy books. S8 wanted to read the third novel in the Nancy Drew (classic) series. Her search was interesting, because she discovered that it was difficult to figure out which book was the third (they are not listed sequentially in the catalogue search). So she had to go talk with the librarian to figure out which one was next, and then she had to look for it on the shelf. (It’s The Bungalow Mystery, by the way.) 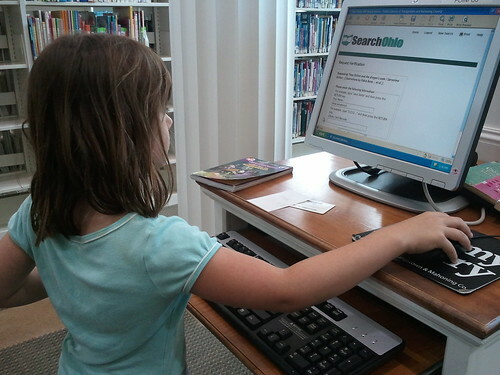 She found her Nancy Drew book at our branch, and then requested another book on Search Ohio. Today we did some reading at home in the morning. O7 is on the sixth book of the Warriors series. S8 was finishing a Nancy Drew novel (book 2, I think). In the afternoon, the kids went to their gymnastics classes: O7 for two hours, and S8 for one hour. Friday, they will be attending an all-day gymnastics camp. It’s nice to have some opportunities for physical activity indoors when the weather is so uncooperative for outside play. 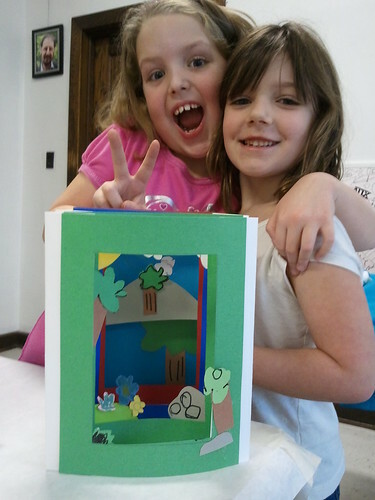 Today we finished up our tunnel books class at the Butler Institute of American Art with Mrs. George. They came out absolutely great. 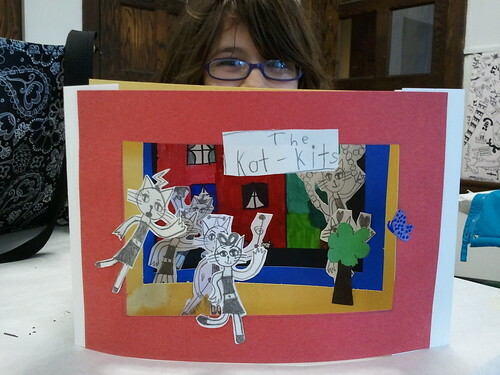 S8’s effort is of the Kat Kits, some cat-esque characters she made up some time ago. They appear in her stories and drawings frequently and have very unique personalities. O7 did a forest scene. Here, she is showing off with her goofy friend, E8. After class, we went for lunch at BK so the kids could run around a bit. I sat with A8 and E8’s moms and we talked about– what else– the kids. In the evening, we went for our regular gymnastics class. O7 was with the preteam for the first hour, then S8’s class joined them on the floor for the second hour. After dinner, the girls and I started Farmer Boy, second in the Little House series. We finished up Little House in the Big Woods the other day. They are constantly begging me to read these.